The Mississippi Delta is perhaps best known for its rich blues history. Like many other regions of the South, there are tremendous numbers of beautiful buildings of historical importance in this land deposited by one of the country’s most historically important rivers. 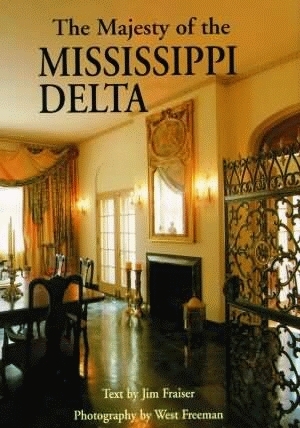 From historic Port Gibson to up the river toward Memphis, Jim Fraiser’s evocative text details the architectural features of homes, churches, and stores dating back as far as the early nineteenth century. Every column, balcony, and pilaster has a story to tell. Some are new stories: what was once the Delta Grocery and Cotton Company is now The Ground Zero Blues Club, owned in part by actor Morgan Freeman. Stories of the days when cotton was king abound as well, like the story of the Willis Cowan house, built by the daughter of Vicksburg’s founder in 1832. Whatever your taste in tales, the photographs capture the seldom-seen interiors and abundant details of these grand homes and simple structures remarkable for their tenacious grip on the land. Jim Fraiser lives and practices law in Jackson, Mississippi. Active in local theatre, both as a playwright and actor, Fraiser has appeared in feature films including Ode to Billy Joe and Mississippi Burning. He is the author of Mississippi River Country Tales: A Celebration of 500 Years of Deep South History. He is a recipient of the William S. Richardson Memorial Award for Poetry and writes for a number of local newspapers and magazines. West Freeman is a native New Orleanian. His photographs have been featured in Architectural Digest, New Orleans Magazine, and the Times-Picayune and are a part of the permanent collection at the New Orleans Museum of Art.